Guide to D1 Refills – Pens! Paper! Pencils! 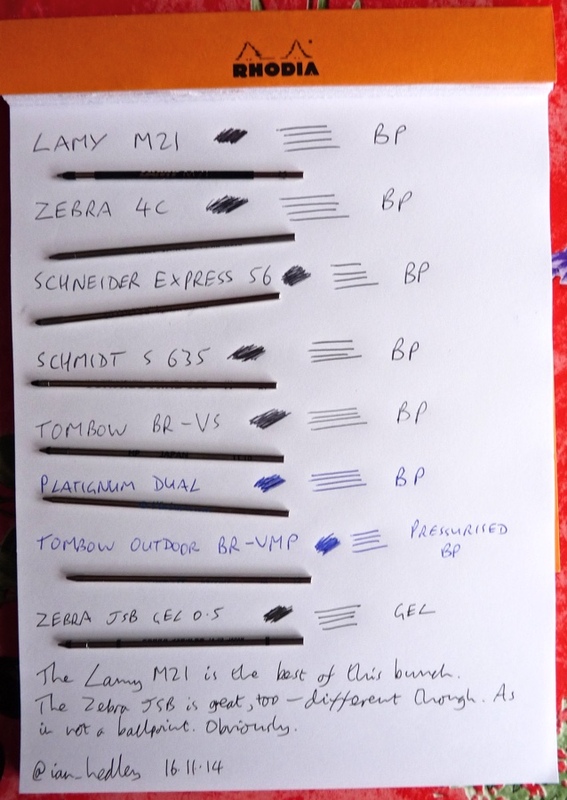 Many moons ago I did a comparison of six different D1 refills and called it ‘part one‘. I was fully intending to do a ‘part two’ soon after but it didn’t happen. Here it is now, though. Better late than never! 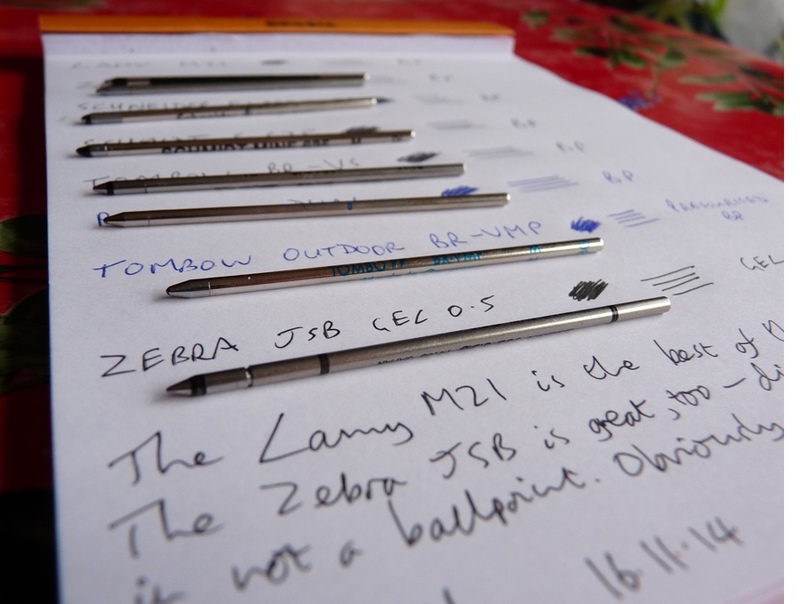 Just to recap, D1 refills are small refills used in many Kickstarter projects and multipens. They’re mostly ballpoints but Pilot and Zebra do gel refills too. In part one Monteverde Soft Roll Mini D13 and the Faber-Castell Ballpen came out on top. Will they stay there? This is a lovely smooth writer that puts down a consistent line, starts well and isn’t gloopy. This is a pretty standard ballpoint. It works okay although does feel like it’s trying to get away from you a little. There’s nothing special about it. In common with full-sized Schneider ballpoints, this is a very smooth writer but it always feels as if it wants to escape and write more quickly than I want to. This isn’t quite as smooth as the Lamy M21 but it has a blacker ink. It’s perfectly fine but not special. Pale ink, inconsistent line, not nice at all. This is okay. Nothing special and I could only find it with blue ink. This is another refill I could only find in blue. It skips a lot and isn’t pleasant at all. It is pressurised so you could write horribly upside down or under water if you wanted to. This is a mighty fine gel ink refill. Lovely dark crisp line. After trying out all these ballpoints it was a real treat to finally get to a gel one, I can tell you! I’ve now tried out twelve D1 ballpoint refills and two gel ink refills. Of the ballpoints, the two Tombows and the Platinum SBSP-120S were terrible. The Lamy M21, Faber-Castell Ballpen and Monteverde Soft Roll Mini D13 (the latter two from part one) were all pretty good. The rest are all okay but, really, why settle for okay when you have so much choice? The best of the lot is the Lamy M21. It’s the smoothest writer but doesn’t ever try to run away from you. Both the Pilot Hi-Tec-C and Zebra JSB are great gel ink refills. Both are expensive because they run out of ink quickly, making the cost-per-word a lot more than any of the ballpoints. I haven’t been able to test this objectively but it feels as if the Zebra runs out of ink quicker than the Pilot. I prefer how the Zebra writes but there’s not much in it. Extra special thanks to Cult Pens who supplied most of the refills I’ve tried out in this part. They have a huge selection of D1 refills including all the ones I’ve tried here and quite a few more too. As mentioned in the comments, since writing this I have discovered the Uni-ball Jetstream D1 refill. This is wonderful and, though quite pricy, is currently my D1 refill of choice. Glad it was helpful. I wrote them because I didn’t know where to start myself. Hi! I was using the Zebra 4C-0.7 as it was most commonly in stock in my country but it was too pointy and felt like it was scratching the paper. After reading your very comprehensive reviews of D1 refills, I know what I should try next. Thanks!! Great! Glad it was helpful. Thanks Ian – really helpful! Yes that would be interesting to know. 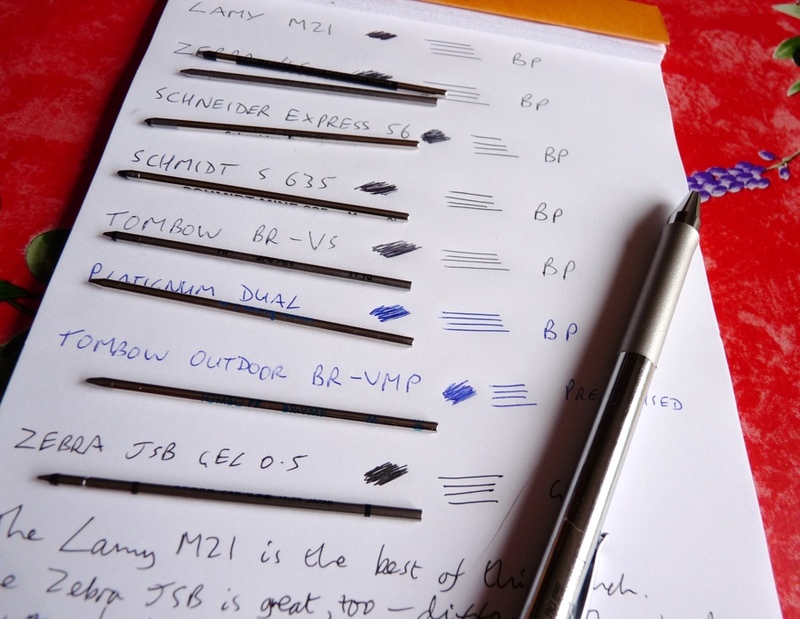 Thanks again for this article … might give the Lamy a try after my Monteverde supply runs out. Much appreciate your time on this article. again … like the font (a lot). What theme is this ? It’s a slightly tweaked version of WordPress’s Twenty Thirteen. Thanks for taking the time to leave such an interesting comment Zach. I love the Jetstream D1 refill but didn’t discover it until after I’d written this. I’m glad you’ve written about it because I kept meaning to add it to the list. It’s my favourite, at the moment. I don’t know where in the world you are but they’re available singly from Cult Pens in the UK and Jetpens in the USA. Both have quick shipping. It’s still an expensive refill though. If you get around to running another comparison, I’d love to read your opinion of the Fisher UF4. On a side note, I have been using a Neo smartpen N2, which uses a D1 pen insert and digitizes as you write. I have tried the Pilot LHRF-20C4 and the Zebra 4C, both write very well, but the pen’s digitization is noticeably more accurate with the Pilot. I don’t know if that is due to the Pilot’s needle-point or if the zebra has some imperceptible flex that throws it off. Thanks Todd, I’ll have a look at the Fisher refill. I do plan on updating this and turning it into a page for easier reference but I doubt I’ll be able to do it until next year. I think you’re going to need a part 3 that includes the Kaweco D1 refills. I’ve been really impressed with their Parker-style ballpoints especially the Gel ones, although you do pay a premium. Thanks a lot for parts 1 and 2, very infomative. I think you’re right, there’s going to need to be a part 3 sometime. It’s good that there are more becoming available. I’ll get some of the Kaweco ones soon, thanks for letting me know. If you can drop me your snail mail address Ian I’ll send you a couple of Kaweco refills to try. I have blue 0.8 mm and black 1.0 mm. Would love to see a review of D1 refills smaller than 0.5mm. I bought a no-name decent quality multi-pen that happened to come with some extra fine writing refills. I approximate 0.3mm. Very smooth, seeming to be gel instead of ballpoint. And sadly, they have no imprinting on them! No indication of brand. I sure wish I could find out what they are, to get more. Levenger offers a refill for their Walletini pens (and perhaps others) called “Levenger Mini Pen Refill”. It’s labeled D1. They write nicely, never leak. I do have a pack (5) plus a couple, which have dried out even though they come in a hard acrylic or polystyrene holder and a mini zip lock bag. I have had years of good experience with them. It is the smallest good pen I’ve written with. It has a a good clip built on the SS body. Secondly, would one of the small Fisher: bullet, Stowaway, Trekker, be worth time testing. I have 2 of the 3 and like them. Lastly Nite-Ize is now making several but I haven’t found the writing experience to be very good. Looking for a d1 with a .5 or .338-ish point. The one I bought, sadly didn’t have a very good spec side to it and it is a 1.mm. It’s a present for my wife and she prefers a finer point than .7, any suggestions? It’s for a d1 cross over? Has to be black ink too. I’ve not had chance to include them in this comparison yet, but the Kaweco Soul D1 refill is excellent and available with a fine tip and black or blue ink. Hi Ian, I to am using the Neo smartpen N2, however I have the rebranded Moleskine version that’s part of the Smart Writing Set. I thought I would let you know, if you are looking for more D1s to try, there are at least twelve D1 ink refill brands recommended by Moleskine that I don’t think you covered. I don’t know how to put pictures on here, but if you go to the Moleskine website and go to the support page for the Moleskine Pen+ they are listed. I found another brand tonight called Cross at my local Staples here in Canada. It writes pretty well, better then the crappy cheap Zebra 4C that comes with the Moleskine pen, but I still feel like I’m murdering the paper. It’s just not smooth writing. I found a five pack of Uni Jetstreams on Amazon Canada for $10, hoping they deliver! If you can’t find the list reply here and I will type them out. Hi, what about OHTO Needlepoint Multipen Refill 0.7 (R-4C7NP) for blue, Red and black and even 0.5 (R-4C5NP) only for black? Does anyone use it?